Griffin engineers are experienced in taking idea’s from concept to production. We use the latest 3D modeling software and CAD packages to help design products and manufacturing processes. Our brazing department uses innovative techniques that give us the ability to braze small lot runs as well as full scale production. 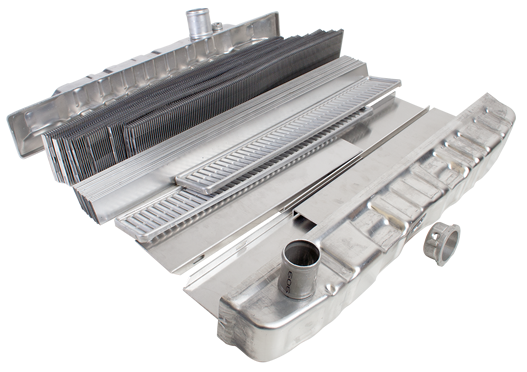 We have a complete line of brazing equipment to produce a variety of cooling components. Our welding lines utilize the best craftsmen in the industry. Production quantity fixturing as well as small lot processing are utilized. All welds are fully leak tested and inspected throughout our process to ensure quality. Griffin Thermal Products is proud to stock thousands of parts in our on site 50,000 sqft warehouse. Most in stock items are elligible for expedited delivery to both end users and distributors. When you need us we wont let you down. At Griffin we are proud to build one of a kind custom radiators. Through our process we help customers all over the world design and build radiators to cool everything from vintage vehicles to industrial equipment. If you need a custom radiator we’re here to help. Give us a call today at 1-800-722-3723 or download the form below. Griffin was founded on customer service and satisfaction. We work with you to manufacture the radiator you desire and that meets your exact requirements.